Over the last 40 years, solar panels have been installed and removed on the White House under three different presidents, starting with Jimmy Carter installing panels and Reagan removing them less than 10 years later. Each successive installation and removal is representative of a sea change in the country’s values at that time and highlights how quickly sentiment can change in politics and among the public. Let’s look back into history to see how this story unfolded. In the 1970s, the United States was facing an energy crises like it had never experienced before. With an oil embargo in full swing, everyday citizens waited in long lines just for a little gas to put in their cars. Then-president Jimmy Carter felt renewable energy, including wind and solar, was the best method of liberating us from foreign oil and to create an energy-independent country. As a symbol of what he hoped was the country’s future, as well as to display his own trust in the new technology, he had 32 thermal solar panels on the roof of the white house that produced hot water for the cafeteria and laundry services. While the installation made a minuscule dent in total US energy use, Jimmy Carter felt the installation was a symbol of what the United States could become – a more independent and progressive country. In 1981, Ronald Reagan beat out Carter in the presidential election, ushering in an 8 year span where Reagan’s free market ideals and the belief that business and industry is best left to take care of itself, simply didn’t mesh with Carter’s subsidization of renewable energy research and industry development. Under Reagan, funding was cut for the newly-formed Department of Energy and, in 1986, when the White House needed roof repairs under the solar thermal panels, the Reagan administration removed the panels and quietly decided to not reinstall them, claiming it simply wasn’t a cost-effective option. The panels were moved to a government warehouse, where they sat unused for years next to old office equipment and supplies. In 1991, according to an article from Scientific American, a director at Unity College in Maryland saw a picture of the forgotten panels and decided to campaign for their purchase by the university. He wrote to former president Carter for his opinion on the prospect of moving the panels elsewhere, who responded enthusiastically that he’d like to see them used no matter the situation. After receiving a letter of endorsement from former-president, the federal government decided to sell the panels to Unity College for a $500 administration fee. After picking up the panels and transporting them back to Maryland with the university’s school bus, donations began pouring in in support of the project, including $150,000 of stock from the actress Glenn Close. Due to size restrictions, 16 of the panels were installed on the roof of the university’s cafeteria and produced hot water until 2005, when use of the thermal solar panels was discontinued by the university. Since then, the university is slowly donating the panels to different organizations and museums, including to the Smithsonian in Washington DC and the Solar Science and Technology Museum in Dezhou, China. Most people aren’t aware of is that the White House grounds are actually administered by the National Park Service and shortly after George W Bush was elected president, the park service installed a 10 kilowatt photovoltaic service system of 167 panels – the first solar electric system on White House grounds – as well as 2 thermal solar system to provide hot water. These installations apparently took place with little interest from the then-president and vice-president, who were out of town when the installation took place. The solar system still exists today, pumping out electricity and hot water for use on the White House grounds. In 2013, in response to calls from the solar industry, Obama announced that solar panels would be installed on the roof of the White House for the first time since Carter installed the first panels in 1979. Unlike the first solar installation where Carter focused on energy independence, Obama focuses on the technology leading to a more sustainable future, as well as the financial savings and new industry and job growth in the country. Unlike Carter’s thermal solar panels, which only provide hot water, Obama installed PV solar panels that produce electricity (also representative of the solar industry’s change, as very few thermal solar systems are installed these days). Installers completed the 6.3 kilowatt system, about the size of an average residential solar system, in 2014. 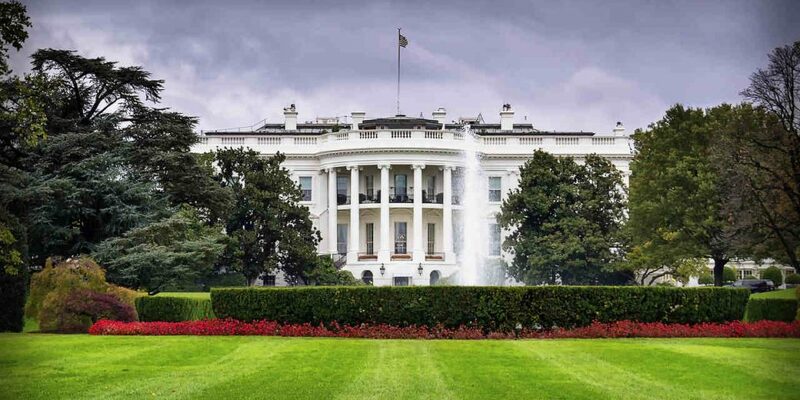 Whether for energy independence, sustainability, or financial savings, solar on the White House has seen a tumultuous ride. What happens in the future is anyone’s guess. Hillary Clinton already mentioned that she supports solar on the White House. Trump’s rare statements on solar show his skepticism to the technology and the solar industry, and if elected, it’s truly anyone’s guess as to what will happen. If history has taught us anything though, it’s that one person (even if he’s the president), can’t stifle the growth of solar. Even if the panels are removed one day, 10 or 20 years down the road, another president might just come and reinstall it.